LAKE OSWEGO, Ore., Aug. 28, 2018 /PRNewswire/ -- The Greenbrier Companies, Inc. (NYSE: GBX) today announced that its Executive Vice President (EVP) and Chief Financial Officer (CFO), Lorie Tekorius, has been appointed EVP and Chief Operating Officer (COO) by its Board of Directors, with expanded responsibilities, continuing to report to William A. Furman, Chairman, President and Chief Executive Officer. 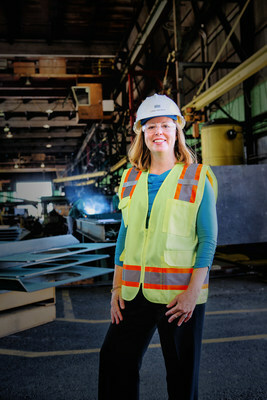 In her newly-created COO role, Tekorius steps into leadership for Greenbrier's wheels, parts and repair operating unit and takes on additional responsibility for human resources and corporate safety & security. Rick Turner, Senior Vice President for Wheels, Parts & Repair, will report to Tekorius. Turner will manage 24 wheels, parts and repair shops, double the number of locations in the Greenbrier shop network, after the dissolution of the GBW Railcar Services joint venture and the return of Greenbrier's shops announced August 20. Adrian Downes has been promoted to Acting CFO and remains reporting to Tekorius. Downes joined Greenbrier in 2013 as Chief Accounting Officer and has over 30 years of accounting and finance experience in a variety of industries, both with publicly held and privately held companies. He currently directs all Greenbrier's global corporate and operational accounting activities and oversees Greenbrier's information technology and tax planning functions. Tekorius continues her management of corporate strategy and oversight of Greenbrier's financial team as well as investor relations and planning led by Justin Roberts, Vice President, Corporate Finance and Treasurer. Additionally, she chairs Greenbrier's executive committee comprised of senior management. Tekorius has been with Greenbrier for 23 years in various financial capacities. Tekorius was appointed CFO in February 2016 and Executive Vice President and chair of the executive committee in April 2017. In May 2018, she was recognized by the Portland Business Journal for her corporate and community work as Oregon's "CFO of the Year—Public Company Category". Furman stated, "Lorie is a highly skilled executive with more than two decades of service to Greenbrier. Her promotion and enhanced responsibilities reflect the reality of the increased duties she has accepted through her successive advancements in management at Greenbrier. Lorie has demonstrated a strong sense of our values, including integrity, respect for people and customers, along with an ability to collaborate across the organization to achieve shared success. Lorie's promotion to COO today demonstrates Greenbrier's emphasis on growing from within as we continue to plan our future. In her enhanced role, Lorie will help Greenbrier focus our energies on management's strategic plan to emphasize growth and scale while building our bench of talent and sharpening our succession plans throughout the company." Greenbrier—headquartered in Lake Oswego, Oregon—is a leading international supplier of equipment and services to global freight transportation markets. Greenbrier designs, builds and markets freight railcars and marine barges in North America. Greenbrier Europe is an end-to-end freight railcar manufacturing, engineering and repair business with operations in Poland, Romania and Turkey that serves customers across Europe and in the nations of the GCC. Greenbrier builds freight railcars and rail castings in Brazil through two separate strategic partnerships. We are a leading provider of freight railcar wheel services, parts, repair, refurbishment and retrofitting services in North America through our wheels, parts & repair business unit. Greenbrier offers railcar management, regulatory compliance services and leasing services to railroads and related transportation industries in North America. Through unconsolidated joint ventures, we produce industrial and rail castings, tank heads and other components. Greenbrier owns a lease fleet of over 8,500 railcars and performs management services for 368,000 railcars. Learn more about Greenbrier at www.gbrx.com.